Welcome to uni freshers!! 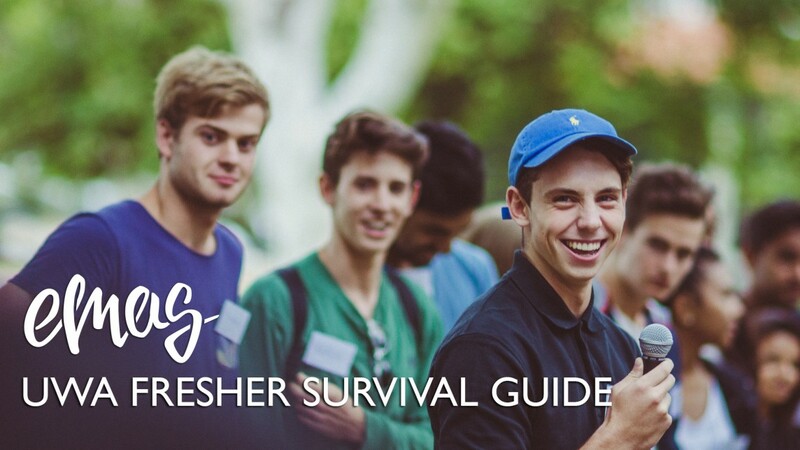 Your best m8’s over at EMAS want to make your transition from school to uni the best it can possibly be, so we’ve made a comprehensive guide of everything uni related that you need to know to get started. This includes where to eat, study and socialise, plus what clubs to join and parties to go to. We hope this helps you to survive your first few weeks of uni! An iconic American themed bar conveniently located right next to UWA, is a common place for a feed after a long day of not attending your lectures has finished. Although the drinks and food are not very student friendly they are definitely worth the money. Varsity is also great for mid day bevs with your mates while you play a game of pool or table tennis. Minus the American theme, the UWA Tav is very similar to Varsity however it’s a minute walk from most places on campus rather than 20 making it much more convenient for a quick bev in between your classes. It’s debatable which bar has better food but the Tav also is more spacious with more places to sit. It has decently priced food, average quality but heaps of variety. The best and maybe the only perk of the ref is its convenient location and it has plenty of seats. Although if you plan on checking your phone over lunch, don’t count on having any service at the ref. Also note that the ref is closed this semester for ‘renovations,’ hence the excess of food trucks. For your standard customised sandwich, Subway is the place to go. Convenient and always satisfying, who doesn’t love a good sub, that always makes us feel like we’re being healthy. Keep an eye out for the deals as well- a footlong for $8?, yes please. Thanks Guild for this useful enhancement to UWA food culture. Whilst the food was once hardly eatable, over the years, the Guild Cafe has improved- they make decent coffee (as good as it gets at a uni cafe), they have a large variety of cold and hot food, an assortment of drinks and let’s not forget the candy bar. It’s also open until 8pm every night, although I wouldn’t rely on this. The Economics and Commerce Society are THE commerce/business club at UWA. I would highly recommend everyone studying commerce join ECOMS as they run a bunch of networking events with their corporate partners (to help you get ahead in the business world) as well as many study groups and educational assistance programs. By far their biggest event is the ECOMS Ball, which has students camping overnight to get their hands on lucrative tickets which sell out consistently year after year. I’ve heard rumors that ECOMS ball is the biggest ball in the southern hemisphere, but then again I also heard they were supposed to serve dessert. Arts Union are the society for those studying any one of the broad range of arts majors. Like all Fac-Socs, they run a range of networking and educational events accommodating for arts students. They also run a few social(ist) events such as Arts Ball, a couple pub crawls and quiz nights, plus their elections are pretty entertaining so make sure to head down to those. Look around for the yellow and you’ll see the University Engineers Club, the oldest club on campus. You’re sure to find them long haired and barefoot, lurking in groups in Clough or Reid Collab, only coming out to sell sausages on Fridays. Their pub crawls are not to be missed – they sell out every year very quickly, while UEC cocktail is a massive event which is run every year without fail. They also run a bunch of study sesh’s and meet and greets for the engineering community. The UWA Science Union are in charge of the Science faculty, which also covers UEC – hence why they are inseparable. They run a variety of networking and educational events for all those studying a science major. Their best social events include Hyperscience, and their quiz nights which are (arguably) the best on campus. Blackstone are the law students society of UWA. They have a long standing rivalry with UEC, which admittedly has died down in recent years. They throw a bunch of undergraduate law events, for the undergrads looking to do post-grad in law. Their biggest event is the Courtyard Show, which is run the first Friday of first semester and the last Friday of second semester. Taking out the Best SOC Club and runner up best PAC Club in 2015, EMAS has a reputation of being one of the most professional social clubs on campus. The club’s main focus is on electronic music and djing but also participate in many welfare and educational events. The two major events are the festivals Miami in semester 1 and Ibiza in semester 2. in 2018 Miami Paradise will be happening on Friday April 13th and is expected to live up to its high expectations. EMAS is also well known for the numerous club takeover nights at places such as Villa, Ambar and Flyrite to name a few with members of EMAS getting cheaper tickets. They also take pride in their Charity participation such as being involved with organisations such as Ronald Mcdonald House and Relay for Life @ UWA. Last but certainly not least, EMAS also hold DJ and music production lessons in semester 1 and 2 free for their members and in 2015 brought in Masterclasses and networking nights to get more involved with the music industry. LEISURE is the closest you’ll get to fraternity culture at UWA. They’re filled with all sorts of fun people and are always up for a tav sesh. Uni Camp for Kids is WA’s oldest run children’s charity. Each year they hold four picnic’s where Uni students partner up and spend the day with kids from low socioeconomic families across Perth. They also hold camps at the beginning of the year for the same families. If charity and banter are your thing the UCFK is for you. Guild elections are an interesting time in the uni calendar. Happening around September, it’s best to avoid coming to uni at all during this time unless you absolutely have to, in which case avoid walking through uni and take the outskirts. You won’t really understand guild politics in your first year and you’ll just vote for the party which has more of your mates but by the end of your degree you’ll realise that just not voting and avoiding everyone is the way to go. More formally known as the Gazebo at Matilda Bay Foreshore this place is a common ground for uni students. It’s mainly used as a gathering spot for cheeky antics while you have BBQ and look over the city. It is also a common spot for small club events such as sundowners and fresher elections. Overall good memories will always be made at the Goonzebo and it’s the perfect spot to take a break. With a fresh lawn for 2016, Oak Lawn is a great meeting point at common lunch hour to catch up with mates and grab something to eat. The service isn’t as bad as the ref, the tree’s provide plenty of shade and if you’re lucky enough, you can grab a spot on one of the benches. Although the nice new lawn is in for a treat come April 13th, it will be turned into the site for Miami Paradise so make sure you take advantage of the lawn while it’s still there. This place is a nice, out of the way spot to just chill out and enjoy some peace and quiet. Located across from the Bayliss Building, you get a alot of students heading to class at the Business School every hour which may wake you up from your nap. You probably should be going to that class as well so its not entirely a bad thing. Really this isn’t the best place to study but during exam time Reid is open 24/7 and when you left study to the last minute it’s a great place to chill while you cram at 3am. Otherwise if you actually want to get work done don’t go to Reid Collab. These rooms are great for group assignments as they are spacious and are generally sound proof. Some of the best study rooms on campus are in the Barry J Marshall Library or the top floor or Reid Library. This link (http://is.uwa.libcal.com/) is the place where you can book study rooms all over campus. The desk’s located on all the levels of business school as well as the collab area are surprisingly a great place to study. The cafe has some of the best food and coffee and the building stays a low noise level throughout the entire day. Although these spots are limited and generally fill up by the afternoon so make sure to get there early if you want a spot. The main perks of Law library is that it is in a very central location and it very quiet. You can generally always find a computer on first floor or find a tucked away desk on the second floor during non-peak times. The main negatives about law library though is that if you’re not studying law, none of your textbooks will be there and the toilets are located outside of the building. *for those who don’t know, the pit is a large piece of sand located the the east side of Business School where everyone parked their cars, didn’t pay for tickets, crashed other parked cars and got away with it. The biggest uni tip you will ever get is to never buy your textbooks. If you need to answer questions from textbooks, borrow them from the library, write the questions out or take photos of them. If you really want to buy them, always buy second hand. Anything regarding the libraries such searching for textbooks, renewing loans etc. can be done at http://www.library.uwa.edu.au/. Go to www.print.uwa.edu.au when connected to Unifi. Leave uni, enrol in tafe, change your name, inform your parents that you are a failure, if possible tattoo an F onto your body and learn to accept that you will probably die alone. Nah just repeat it the next semester and try to forget the fact you’re in even more debt because you’re a failure.